The Intergovernmental Panel on Climate Change (IPCC) recently issued its 5th assessment on climate change, essentially reaffirming that disaster awaits the world if CO2 emissions aren’t cut worldwide to 50% below 1990 levels by 2050. The various sections of the assessment have been issued piecemeal so as to gain maximum media coverage. The fundamental message remains the same: The world must cut CO2 emissions 50% below 1990 levels by 2050, however, developed countries, such as the United States, must cut their emissions 80% below 1990 levels by 2050 so that developing countries can continue, albeit at a slower rate, to increase their CO2 emissions. In spite of this nod to developing countries, China, a developing country, refuses to accept the demands of the IPCC. The critical question, aside from whether CO2 has a significant effect on climate, is what it would mean for the United States to cut its emissions 80% by 2050. Here’s what’s involved for the United States1. Factually, 2.3 MT/person is an absurdly low level of per-capita CO2 emissions for the United States. To put it in context, it’s the level of U.S. per-capita CO2 emissions at the turn of the last century, i.e., 1900 … before the First World War. There were very few automobiles, no commercial airplanes, no tractors and fossil-fueled power equipment for growing the food we need, no TVs, few electric lights, or any other powered equipment, such as refrigerators or air-conditioning units. In other words, radical environmentalists want Americans to return to the “good old” days of virtual poverty. This is the level that must be reached, or, according to the IPCC, there will be a calamity. 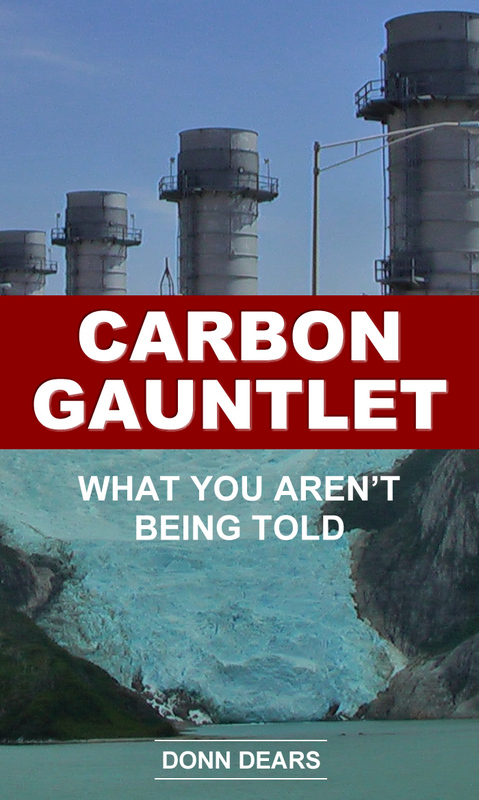 By definition, as explained in Carbon Gauntlet, a worldwide disaster is unavoidable; because it’s impossible for the United States to reach this level of CO2 emissions, while worldwide CO2 emissions continue to increase with China, and other developing countries, continuing to increase their CO2 emissions. These are incontrovertible facts … the real Inconvenient Truth. Cutting emissions by something less than 80% is futile, because, according to the IPCC, they MUST be cut 80% in developing countries and 50% worldwide, or there will be a disaster. Cutting CO2 emissions by less than 50% worldwide won’t prevent the disaster. When viewed in this context, the entire IPCC exercise is bizarre. How can it be anything else? Why are radical environmentalists and this administration2 trying to coerce Americans into cutting CO2 emissions to the point where Americans become impoverished? Calculations in Carbon Gauntlet, based on 2004 emissions data and slightly different population estimates, arrived at essentially the same conclusion, i.e., 2.4 MT/person. The EPA has made 80% reductions by 2050 its target. Several alternatives to gasoline and diesel fuel have been suggested. What other alternatives did you have in mind? Donn, I recently did a simple analysis of what would be required to reduce CO2 by 80% by year 2050 and relative to CO2 in year 2005 (the IPCC and EPA recommendation). The US already has reduced its CO2 by ~15%, mainly by greater energy efficiency and conversion from coal to natural gas (NG). Total substitution of NG for coal in power production would give ~28% CO2 reduction. If all vehicles were converted to run on either NG or electricity (made from NG), then CO2 reduction might be ~37%. If one assumes some additional energy efficiency, then one would get ~40% CO2 reduction, or only about half of the IPCC & EPA desired 80%. And none of this considers future energy growth. To obtain 80% CO2 reduction in the US would require total disuse of fossil fuels as energy sources. For the world as a whole to reduce greenhouse gas (GHG) generation (including CO2 by 80%) would likely be harder, at least under current conditions. Most countries do not have abundant NG, their production of CO2 is rising as they develop economically, and they produce more GHG from land use practices compared to the US. Thanks. I agree with your conclusions. In fact, as mentioned in the article, current per capita CO2 is around 16 – 17 tons per person (that’s a rough number as I haven’t actually made the calculation recently). It would require lowering per capita emissions to around 2.3 tons per person to achieve an 80% cut, taking into consideration population growth by 2050. It’s a mirage, an illusion, a fantasy, to think we can cut CO2 emissions 80% by 2050.